In the year to end October 2016 new build house prices rose on average by 6.2% across the UK which is slightly down on last year’s figure of 6.4%. But if Greater London is taken out of the calculation and we take a crude average of the remaining regions, then the average house price growth is 4.6% compared to a figure of 4.1% last year. Looking across the regions it can be seen that whilst some have come slightly off the boil over the past year, others have seen good growth. Two years since Greater London was well into double digit price growth which had fallen steadily to 9.4% by October 2015. But prices in Greater London as a whole have stabilised over the past year and stand at 8.9% for the year to October 2016. The South East, South West, East Midlands and East Anglia are all showing healthy growth at or above 6%. 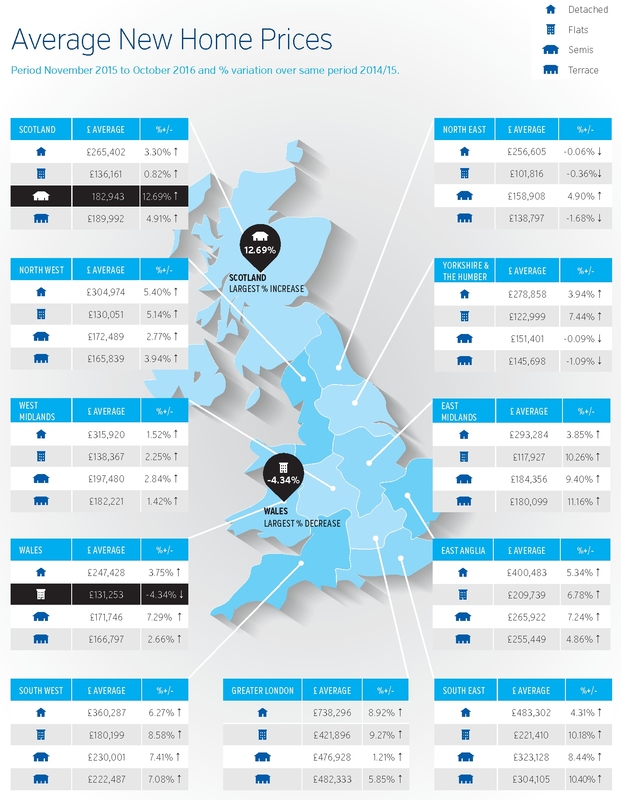 Price growth appears to be particularly strong in the South West over the past year, whilst East Anglia has fallen from the second highest region for price growth last October to fifth place this October. Price growth in the North West and Scotland has increased to 4.4% in the year to end October 2016, whilst growth in Wales, West Midlands and Yorkshire and the Humber remains at a more sedate 2 to 3%. Once again the North East is at the back of the field with price growth approaching just 1%, but remaining in positive territory. The First Time Buyers index calculates an estimated value for a 70 sq m 2 bed property in each region of the UK. It adjusts by region according to the number of flats or terraced houses that are being built and valued in those regions. The index has been recalibrated this month and is now calculated against the Office for National Statistics EARN05: Average weekly gross earnings of full time employees, by region. People. The table shows that whilst earnings are significantly higher in Greater London, this does little to compensate for the very significant difference in average residential property prices.